The planned repayment of value-added tax (VAT) to government welfare smartcard holders is expected to take shape by the end of this year, a move meant to improve their purchasing power. The Finance Ministry is preparing to install a system to pay back consumption tax to the recipients of the government’s welfare scheme, said Finance Minister Apisak Tantivorawong. When smartcard holders swipe their cards at shops with electronic data capture terminals, the paid VAT will be returned to them at a later time, he said. The period over which the VAT is returned might run for a specific interval. For example, spending during three months in one year could be subject to VAT return, he said. The VAT return scheme is similar to a 15,000-baht shopping tax break given to individual taxpayers who purchased goods within a specific period over the past few years, he said. All purchased items including staple goods and even mobile phone handsets can be used to claim VAT returns as mobile phones are crucial in the information era, but the purchase of vice products will not receive the VAT payback, he said. The government’s welfare smart cardholders would get back the VAT once a year and the Finance Ministry will later set the ceiling for the VAT return after discussing the matter with related state agencies, he said. Mr Apisak has repeatedly said the VAT payback will not be considered a tax refund as it will be financed by the state’s annual budget. Deputy Prime Minister Somkid Jatusripitak late last week required the Revenue Department to seek measures to alleviate the consumption tax of people living in poverty as part of government efforts to create more disposable income and strengthen purchasing power. Even though the country’s economy expanded at the fastest pace in 20 quarters at 4.8% year-on-year in the first quarter, the recovery remains uneven, with low-income brackets still facing hardship. Addressing the root of poverty is a government priority and it has provided both financial and work training support to those who are at the bottom end of the income scale through the government’s welfare and subsidy scheme. Under the scheme, the government is giving a monthly living allowance of 200-300 baht to 11.4 million people earning no more than 100,000 baht a year to buy staple goods at Thong Fah Pracha Rat shops and those who signed up for job training receive an additional living allowance of 100-200 baht a month. Some 5.3 million out of 11.4 million recipients of the government’s welfare and subsidy scheme are living below the national poverty line, earning less than 30,000 baht a year. Suttirat Rattanachot, director-general of the Comptroller-General’s Department, said her department is working jointly with the Revenue Department on an application to facilitate the VAT payback scheme. 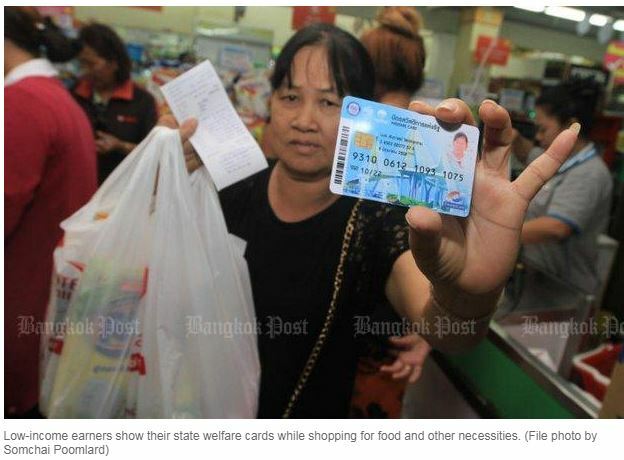 The application will link data to the Revenue Department and the paid VAT data will be collected at the tax-collecting agency’s data system every time smartcard holders pay for goods, she said. Given that the smart cards function as e-wallets, cardholders can add to the monthly living allowance given by the government, which can boost card spending and is in line with the government’s goal of a cashless society, said Ms Suttirat.